Can bonded leather be repaired? Yes it can! Finally a solution to extend the life of your item and save you thousands of dollars in replacement costs. Using our products you can extend the life of the item much longer than if you do nothing. However, we want you to understand what bonded leather is so you won’t be disappointed if your leather continues to peel. This is an excellent example of what you can expect when using Magic Mender products. Because you’re reading this page, we’ll assume that you are one of the millions of people who have the misfortune of owning something made with bonded leather. Bonded leather, bi-cast leather, pleather, faux leather whatever name it’s called, is not Top-Grain or Full-Grain leather. Consequently it does not perform or last like these types leather, which would be considered “real” leather. Bicast leather (also known as bi-cast leather, bycast leather, or PU leather, sometimes described as split leather) is a material made with a split leather backing covered with a layer of polyurethane (hence the term “PU leather”) that is applied to the surface and then embossed. 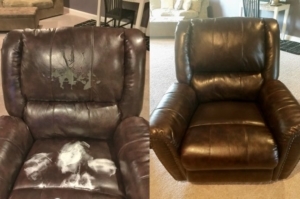 Just like any other product, some bonded leather items are made with better quality leather than others. Some will take longer to peel than others but… eventually they all peel, unless you never use the item. It’s the nature of the product. If your item is flaking or peeling, our repair compound will keep it at bay, extending the life of the item. 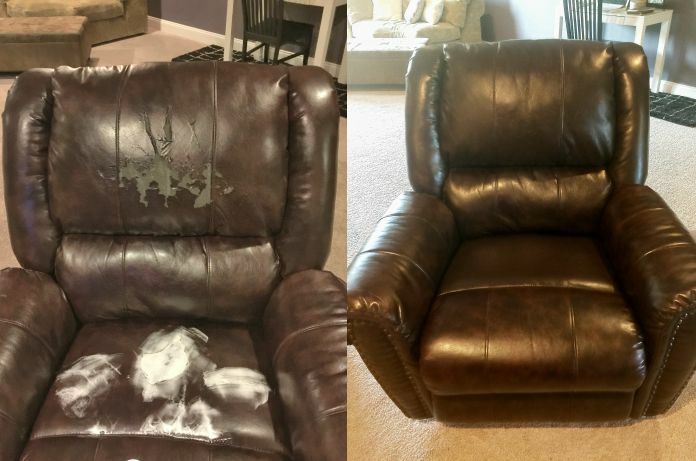 On sections that are peeling or flaking, you should be able to gently peel away the top layer (only the places that are peeling), then apply our repair compound (usually a few layers) followed by our Color Flex Finish, as shown in the before and after photo above. If you try to repair this kind of leather and it doesn’t last, please remember, it’s not the repair products that fail, it’s the bonded leather that fails.